PALM BEACH, Fla., April 6 (Reuters) - The U.S. military launched cruise missile strikes ordered by President Donald Trump against a Syrian airbase controlled by President Bashar al-Assad's forces in response to a deadly chemical attack in a rebel-held area, a U.S. official said on Thursday. Facing his biggest foreign policy crisis since taking office in January, Trump took the toughest direct U.S. action yet in Syria's six-year-old civil war, raising the risk of confrontation with Russia and Iran, Assad's two main military backers. Some 50 Tomahawk missiles were launched from U.S. Navy warships in the Mediterranean Sea, the U.S. official said, speaking on condition of anonymity. A target was identified as an airbase in Homs. Further details on the target and the results of the strikes were not immediately known. ReutersThe Pentagon and the White House are in detailed discussions on military options to respond to a poison gas attack in Syria that killed scores of civilians, and which Washington has blamed on the Syrian government, a U.S. official said on Thursday. U.S. Secretary of State Rex Tillerson spoke by phone with Russian Foreign Minister Sergei Lavrov on Wednesday about a poison gas attack in Syria that the United States has blamed on the Russia-backed Syrian government, a senior State Department official said on Thursday. ReutersA deadly poison gas attack in Syria this week led TV news bulletins across the West with images of the victims -- children and adults struggling to breathe -- front and center. In Russia, it was item 10 of 17 and the victims were not shown. The United States has not excluded a military response to a poison gas attack that killed scores of civilians which Washington blamed on the Syrian government, a senior administration official said on Thursday. Asked whether the military option had been taken off the table, the official said: "No." It is unclear how much U.S. military planning exists on striking targets associated with Syrian President Bashar al-Assad's government. ReutersThe Syrian government set conditions on Thursday for any international inquiry into a suspected chemical attack that killed scores of people, saying it must not be "politicized" and should set out from Damascus and not Turkey. German Chancellor Angela Merkel said on Thursday it was a scandal that the United Nations Security Council did not pass a resolution condemning a suspected chemical attack in Syria this week which killed at least 70 people. "It was a barbaric attack that must be cleared up. The use of chemical weapons is a war crime," Merkel told a news conference in eastern Germany, adding there were some indications it was carried out by President Bashar al-Assad's forces. "It is a scandal that no U.N. Security Council resolution materialised and those who opposed it must consider what responsibility they bear," she said. She declined to interpret U.S. President Donald Trump's comments that the attack went "beyond a red line". The results from Turkish autopsies on the victims of a suspected poison gas attack in northwest Syria will be sent to the Dutch capital of The Hague for an additional examination, Turkish Health Minister Recep Akdag said on Thursday. The suspected chemical attack believed to have been carried out by Syrian government forces killed at least 70 people in the rebel-held Idlib province on Tuesday. Thirty-two victims have been brought to Turkey and three have subsequently died during treatment. ReutersThe Syrian government set conditions on Thursday for any international inquiry into a suspected chemical attack that killed scores of people in northwestern Syria, saying it must not be "politicized" and should start work from Damascus. U.N.'s Egeland welcomes U.S. interest in Syria, hopes for "watershed"
Renewed U.S. interest in the Syrian war is welcome if it leads to a fresh U.S.-Russian push for a political solution, U.N. humanitarian adviser Jan Egeland said on Thursday, after chairing a weekly Syria humanitarian meeting in Geneva. 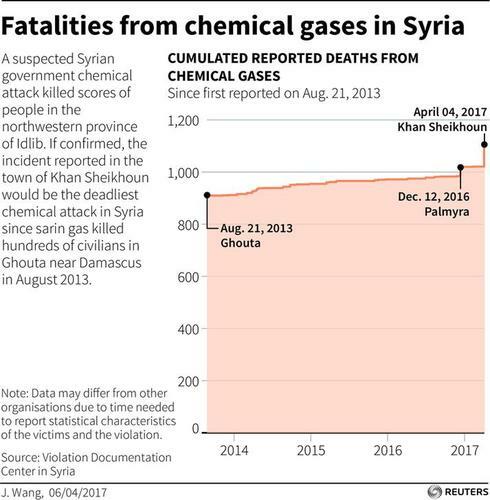 "I hope that this is a watershed moment," Egeland told reporters, two days after a suspected chemical weapons attack killed scores of civilians in the town of Khan Sheikhoun, drawing outrage. "I hope it is a re-birth of diplomacy." He said the U.N. had called on the United States, Russia, Turkey and Iran to push for 72-hour humanitarian ceasefires and aid access for besieged and hard-to-reach areas, including the 400,000 people trapped in eastern Ghouta near Damascus. 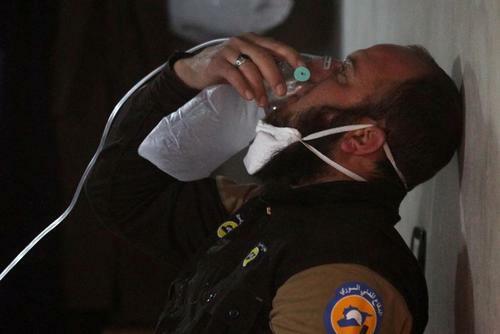 The Kremlin on Thursday called a deadly poison gas attack in Syria's Idlib province earlier this week a "monstrous crime," but said Washington's conclusions about the incident were not based on objective data. "This was a dangerous and monstrous crime, but it would be incorrect to hang labels (to identify those who did it)," Kremlin spokesman Dmitry Peskov told reporters on a conference call. The use of chemical weapons was "unacceptable," he said, urging the Syrian army to ensure such arms did not fall into the hands of terrorists. Peskov said evidence about the incident provided by the White Helmets civil defence group could not be considered reliable and added: "We do not agree with these conclusions." "Immediately after the tragedy no one had access to this region ... any data which the U.S. side or our colleagues from other countries might have had access to could not have been based on objective facts," Peskov told reporters. Russia's Foreign Ministry said earlier on Thursday it was too early to accuse the Syrian government of being responsible for the attack in Idlib and said a proper investigation was needed, the RIA news agency reported. Syrian foreign minister says he recognises the "gravity of the latest U.S. statements"
Syrian foreign minister says any commission of inquiry into alleged gas attack must not be politicised and must "start its work from Damascus, not Turkey"
MORE: Asked if Syria would accept an international inquiry into the alleged gas attack, Syrian foreign minister says past experience is 'not encouraging'. Syrian foreign minister says Nusra Front and Islamic State have been storing chemical weapons bought from Iraq and Turkey in urban and residential areas. Syrian foreign minister denies and condemns use of chemical weapons. 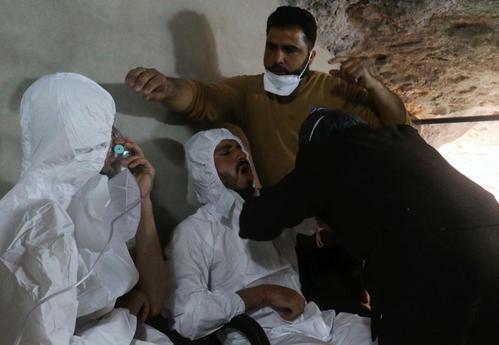 The Russian Foreign Ministry said on Thursday it was too early to accuse the Syrian government of being responsible for a deadly poison gas attack in Idlib Province and said a proper investigation was needed, the RIA news agency reported. 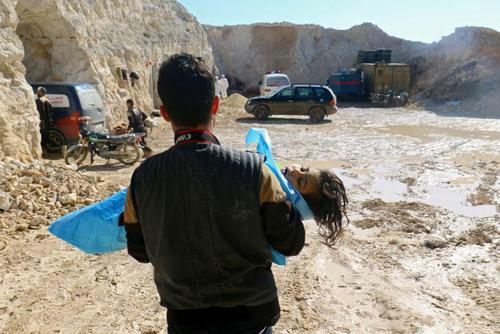 The ministry also rejected U.S. assertions that the attack, which killed at least 70 people, meant a deal to rid the country of its chemical weapons stockpile had failed, saying that the process had in fact been "quite successful," RIA reported. U.S. President Donald Trump accused Syrian President Bashar al-Assad's government of going "beyond a red line" with the attack on civilians and said his attitude toward Syria and Assad had changed, but gave no indication of how he would respond. Reuters UKAutopsy results have revealed that chemical weapons were used in an attack which killed at least 70 people in Syria's Idlib province, Turkish Justice Minister Bekir Bozdag told reporters on Thursday. Reuters UKFrance is still seeking a United Nations Security Council resolution on Syria, foreign minister Jean-Marc Ayrault said on Thursday, adding that diplomatic negotiations were a priority over possible military action. Reuters UKSyrian President Bashar al-Assad said there is no "option except victory" in the country's civil war in an interview published on Thursday, saying the government could not reach "results" with opposition groups that attended recent peace talks. British Foreign Secretary Boris Johnson said on Thursday a United Nations resolution should be passed before any unilateral action was taken in Syria. "It is very important to try first to get out a U.N. resolution," Johnson told reporters in Sarajevo. "I cannot understand how anybody on U.N. security council could fail to sign up to a motion condemning the actions of the regime that is almost certainly responsible for that crime," Johnson told reporters.